S&TC Cymru and South East Wales Rivers Trust, as joint lead partners for the European eel in the Wales Environment Link (WEL) species champion initiative, have come together with National Resources Wales to help protect critically endangered eels in Merthyr. 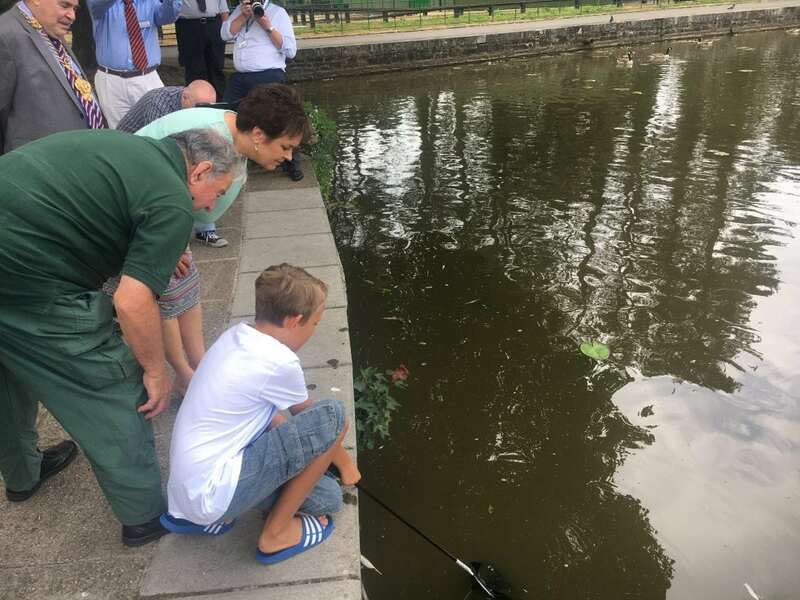 As part of the initiative - which also involves removing barriers to migration - an abundance of young eels (known as elvers) are being released into Cyfarthfa Park Lake. 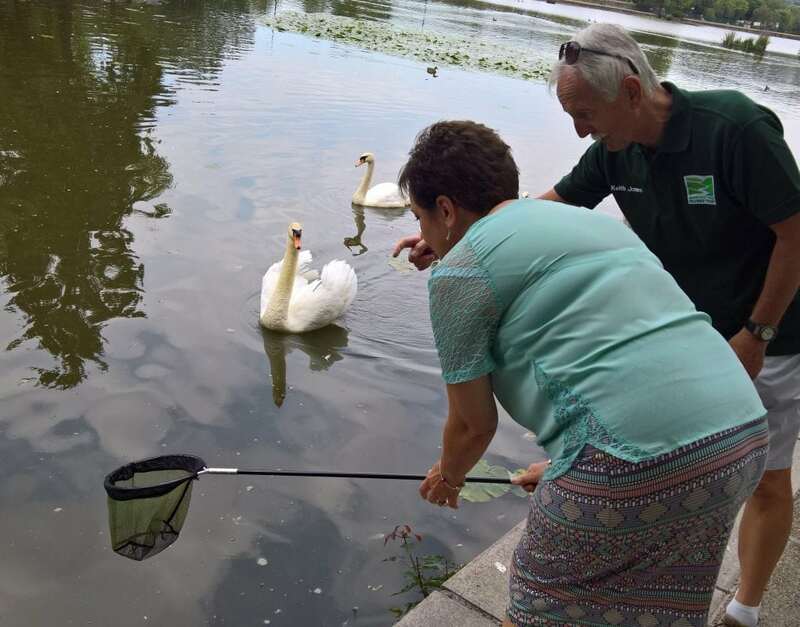 Witnessing the release of the first 15 on Thursday 26th July were Dawn Bowden (Welsh Labour Assembly Member), Gerald Lewis (of Merthyr Borough Council) and the Trustees of Cyfarthfa Park. "Initiatives such as this play a crucial part in conveying the concept of protecting the welfare of future generations, and leaving the natural world in a better state than we currently find it." Why is the European eel important? Historically the European eel constituted 50% of the total freshwater fish biomass in Europe, though recently their numbers have declined by 90 - 95%. Small eels, such as those released at Cyfarthfa Park, feed mainly on insect larvae, molluscs, worms, and crustaceans, but as they grow larger they will also predate other fishes and scavenge on fish carcasses, helping to recycle nutrients. They are also important food for otters and birds such as herons, egrets and bitterns, and the consequences of their decline will be felt at all levels of the freshwater food chain. The loss of this key species will undoubtedly have a direct impact on the ecological integrity of entire rivers and the survival of many of our precious wild fish. Aside from their role in the ecology of freshwater, European eels are a fascinating species with an extraordinary life cycle. They start as eggs in the Sargasso Sea near Bermuda and spend 18 months floating on ocean currents towards the coasts of Europe and North Africa. They enter rivers and lakes and spend anything from 5 to 20 years feeding and growing into adult eels. They then return to sea and swim 3000 miles for over a year, back to spawn in the Sargasso Sea. Just like our beloved salmon and trout, they undertake an immense journey and depend heavily on having a clear route to make their migration. Sadly, their routes have been blocked; the implications of which are also suffered by many other freshwater creatures. The lake, and other waters off the upper Taff, have had no eel population for over a hundred years, since multiple weirs were constructed along the length of the river during the industrial revolution, blocking their upstream migration from the sea. 1.3 million similar barriers across rivers in Europe mean that the eel can only access 10% of the habitats it used to. Numbers of the once common eel have been reduced by 90 – 95%, meaning the species is now classified as ‘critically endangered’. Barriers to migration have severe consequences for all migratory species, and those that rely on them as a food source. As part of this new initiative eels were sourced by the South East Wales Rivers Trust. 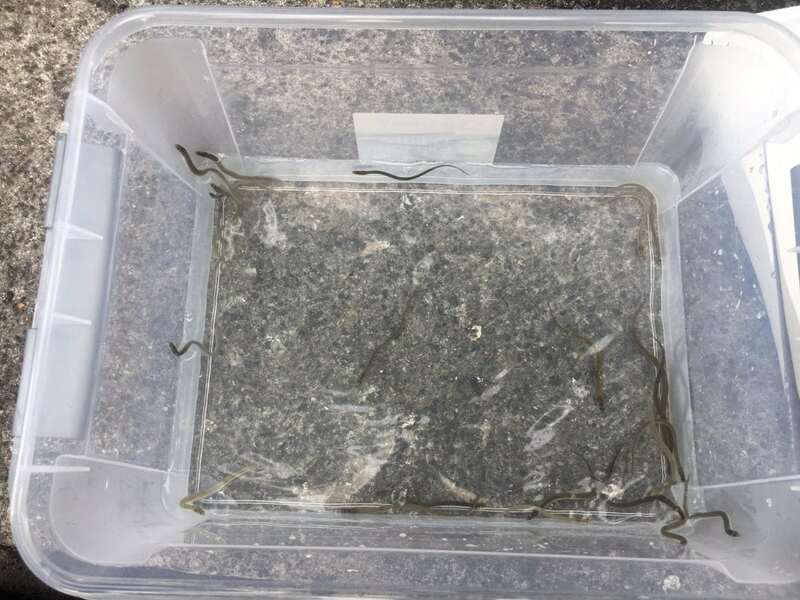 They were part of a programme of placing batches of 50 baby eels in fish tanks in 8 schools and 2 education centres – the Welsh Water Education Centre, Cilfynydd and the Millennium Centre, Taf Bargoed, where the eels for Cyfarthfa Park were raised. At the schools and centres, the pupils fed and looked after the eels for 3 months and learnt about the eel’s fascinating life cycle. Now bigger and stronger, the eels are ready to be stocked into their new home. This is part of a huge programme of work which is underway across Europe to help restore eel populations by restoring wetlands and removing barriers to the eels’ traditional migration routes. Cyfarthfa Park is ideal habitat for eels. They will grow there, become part of the ecosystem and will migrate in 5 – 20 years to sea to spawn and continue the species. Dawn Bowden AM, was made European Eel Champion this year, as part of the Species Champion project run by Wales Environment Link (WEL). WEL members – including Salmon & Trout Conservation Cymru – pair AMs up with endangered species in Wales so they can help recover and safeguard them. Dawn is part of a group of 37 other AMs in the project. 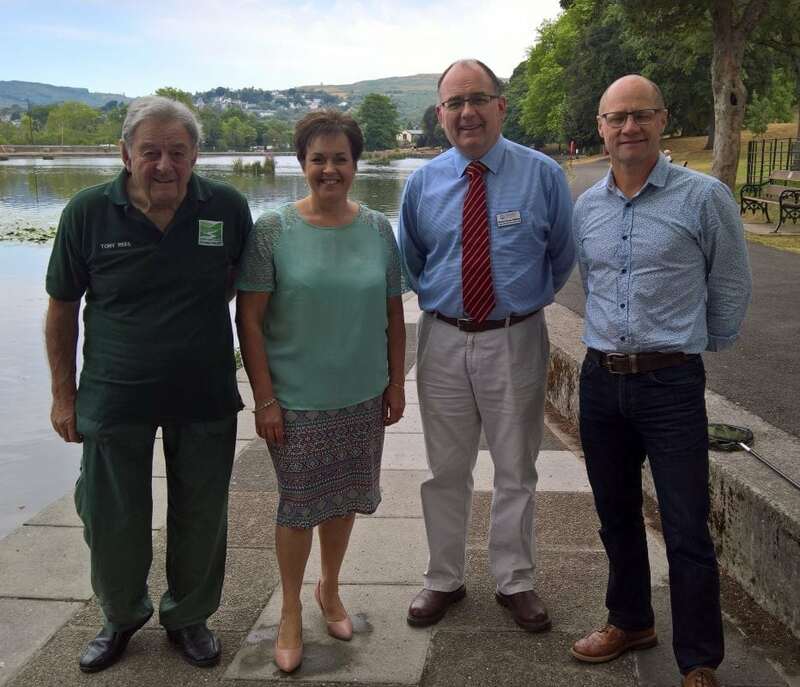 Above, from left to right: Tony Rees (South East Wales Rivers Trust); Dawn Bowden (AM, species champion for European eel, Wales Assembly Member); Richard Garner Williams (Salmon & Trout Cymru); David Bunt (Sustainable Eel Group). "We are facing the very real prospect of our rivers and lakes becoming totally devoid of European eels and it is therefore incumbent upon us to act with urgency if we are to reverse their catastrophic decline. One means of achieving this is to highlight their plight via the Wales Environment Link Species Champions initiative, which takes the cause of our many threatened species to the very heart of government. I am delighted that Dawn has agreed to act as Species Champion for this fascinating yet little understood creature and am grateful for her enthusiasm and support."